Norbert Ehrenfreund was born and raised in Peekskill, NY, the son of Jewish immigrant parents. After graduating with a bachelor’s degree in journalism from the University of Missouri, Norbert distinguished himself in World War II as a Field Artillery Forward Observer in Patten’s army. He took part in the liberation of Nazi concentration camps and received a Bronze Star for valor during the Battle of the Bulge. After the war, Norb took a reporting job with the American military newspaper Stars and Stripes in Europe and was sent to cover the Nuremberg trials, an experience which would inspire his decision to move into the legal profession. After receiving a master’s degree in political science from Columbia University, Norbert went on to Stanford Law School, where in 1960 he received the accolade of “Graduate most likely to bring honor to the profession.” He was with the San Diego District Attorney’s office until 1968 when he left to help found and act as chief trial attorney for Defenders Inc., a private nonprofit firm that provided counsel for the indigent and underserved. Always interested in breaking the cycle of recidivism, Ehrenfreund tried unsuccessfully throughout his career to bring the very efficacious rehabilitation program Delancey Street Foundation to San Diego. In February of 2018 the San Diego County Board of Supervisors announced that they will be bringing in a center for addicts and ex-felons based on the Delancey Street model. Always interested in furthering democratic justice, Ehrenfreund lead a demonstration of an American jury trial in Portugal, and helped craft the details of a new Albanian constitution. He was voted Trial Judge of the Year in 1983 by the San Diego Trial Lawyers Association, and in 2001 was given the Award of Judicial Excellence from the National Conference of State Trial Judges. Throughout his career, Norbert also continued to act and write; he was a regular lead actor at the old Mission and Coronado Playhouses, and received a best actor Atlas award from the Old Globe Theater. He wrote several novels and short plays and published The Nuremberg Legacy (which studies the influence of the Nuremberg trials), as well as two entertainment books, You're the Jury and You Be the Judge, all of which have been used in law classes around the world. 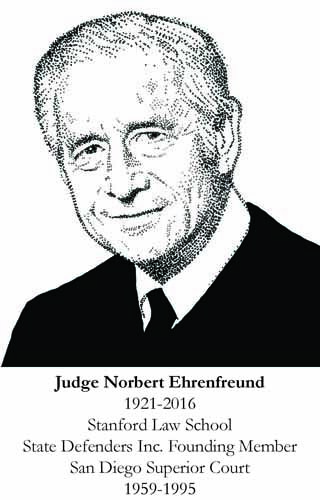 Retiring from the Superior Court in 1995, Ehrenfreund remained active on the bench on assignment in Sacramento and San Diego for many more years. He also developed and toured a presentation on the Holocaust and taught classes on the Nuremburg trials at USD, Cal Western, and Thomas Jefferson law schools. Later he lectured and gave poetry readings in retirement and convalescent homes and volunteered serving meals at a homeless outreach kitchen. He never lost interest in the direction his profession was taking and was enthusiastic about the emerging support for restorative justice. In 2016, a 95 year-old Ehrenfreund was the first member of the judicial branch ever to attend a meeting of San Diego’s Reentry Roundtable, a group of various stakeholders in the criminal justice system interested in improving re-entry and reducing recidivism.